The flying machines have arrived and are changing the way construction is done. With the settlement of mobile technology and IoT(internet of things), everyone had been eagerly looking out for what next; what more could be achieved through this technology to facilitate work. It’d be an understatement to say that people were surprised after watching a fully equipped drone’s flight. Drones, with their agility, precision controls and manoeuvrability are truly revolutionizing the construction sector. Drones or Unmanned aerial vehicles(UAVs) have found their niche and are starting to comfortably blend in with the industry. Their ability to provide new angles to all the aspects of a construction activity makes them very unique. Moreover, they are mountable and can be affixed with different sensors and devices to make it even more useful and powerful. In the construction industry, drones have been doing a major service by keeping the safety aspect in check for the construction teams. They have reduced the need for workers to climb to dangerous heights, deleting the risk and improving safety on the site. Drones have also been helping with the effective transmission of data, mapping, planning, site logistics and a plethora of other activities. Drones’ photogrammetric mapping is being widely used at a number of fronts like mining, agriculture, real estate, archaeology, and, of course, construction. Mapping with drones is done using a technique called Photogrammetry which is the science of making measurements from photographs. The dynamic camera mounted on the drone is pointed vertically downwards to capture the area that requires to be mapped out. After a rigorous flight around the area to be mapped, the data stored is processed through software to obtain a comprehensive survey of land, buildings and infrastructure. The output thus obtained provides you with the ability to take accurate measurements of length, area and volume directly from the maps. Drones equipped with infrared cameras, radar, or laser-based range finders, provide exquisite images of a construction site — and closely track dynamic objects, people, equipment, and material. This data helps the site officials to identify potential safety issues. They also facilitate safer maintenance and keep you wary of the unforeseeable risks. The large gamut of observation of drones makes them an effective option over the ground-work team. Besides safety, Drones are also known to keep the construction sites secure from theft and vandalism. Drones are being used for the detection of precarious conditions, materials, and for assessing structures aerially—without placing workers at risk. 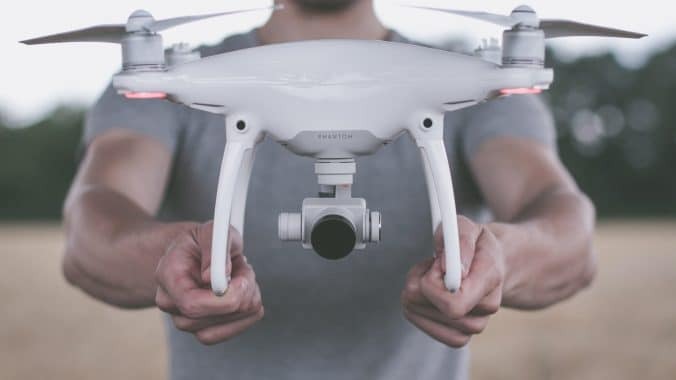 Today, drones are being used for everything; right from inspecting compromised rooftops to detecting heat leaks to ensuring the proper functioning of equipment. They can be flown around structures to check stability and nuanced details, and take high-resolution imagery for analysis. DroneDeploy, a leading cloud software platform, says that drones are ideal for tasks such as assessing building envelopes or investigating a roof for damage. This eliminates the need for someone to climb-up scaffolding or walk across an unsafe rooftop. The ability to use drones to conduct visual inspections of high-risk areas can save time and reduce health and safety risks. Their ability to provide real-time updates of events going on around the site set them apart. Site owners and clients regularly demand the site progress report which requires you to create a detailed list of activities going on at the moment. The process, if done physically, would be laborious and would require you to walk great distances. But with drones, you can gather the information right at the moment and share with the authorities hence easing your job and providing a better experience to the owners. When you own a drone, you own a vantage point. High-quality images and videos captured by drones can be used to create renderings that can help see the potential investors and clients a glimpse of your projects. They provide them with a perception of your capabilities and depict how you would execute the job for them. Showing drone images will give prospective clients a better understanding of your work and what to expect.